Pardon me for the pun, but a chain of people have been linked with Shimano chain failures. Consider this an update to the my first post where a reader alerted me to his concern that large batches of Shimano's Ultegra chains have been failing recently. The said person worked for a cycling magazine so he was probably witnessing this first hand with his access. In that post (click here if you haven't read it), readers and me agreed that a possible suspect may be related to heat treatment that may be causing the links to become brittle. However, at this point, there's insufficient test data to back that thought. As to what the heat treatment protocol it is that chain links undergo is not within my knowledge. If there are industry insiders reading this who want to help provide insight, please feel free to join in with a comment. Within days of writing the post, I obtained news of more instances of failure. 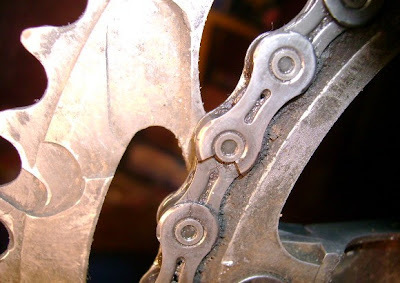 Case 1 : This Shimano 6700 chain, used by Roger failed after just 2500km of use. He wrote to me that he had kept it well lubricated and had never cross-chained excessively (and never with force), yet it broke in the exact same manner as in the images that were shown here. 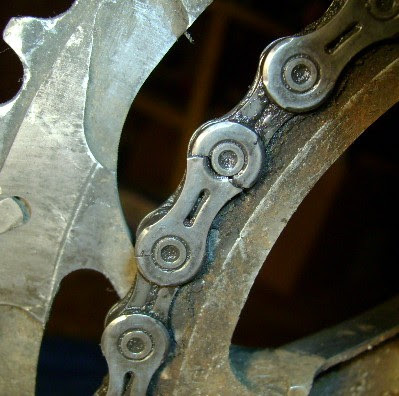 According to him, he had never broken a chain before and would usually swap them out only after 10,000km or so. Apparently, he had them sent back to Wiggle and when Shimano was contacted about it, they didn't recognize the problem. 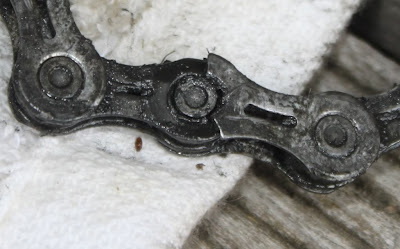 Case 2 : A blogger with Team BBC in Baltimore, Maryland posted a tweet showing his Ultegra chain that broke in a matter of just 7 days. According to him, it was installed as per the instructions yet he was caught by surprise when he found cracked side plates while lubing the chain today. He also remarked on Twitter that another racer from the same area fell and lost some skin after his Ultegra chain broke while he attempted a "track stand". The following pictures were posted on his blog. "My Ultegra chain broke 25km into a ride on Saturday. That was the first ride the bike had ever done - brand new. I had climed for around 300 meters in altitude gain without any problems. It was after the descent when I dropped onto the small chain ring (under virtually no pressure) that the chain broke. Initially I thought it had over shot the small chain ring but then I saw it hanging down into the road. Luckily I had a chain tool and spare connecting pin. But 25km is shockingly poor!" Shimano has not recognized the problem nor have they issued an official statement in spite of multiple failures. It is suggested that they do a root cause study and issue a recall of product from the market if it is defective. Wiggle offered to send me a free replacement chain. They've spoken to Shimano and they still don't see the problem. I politely declined Wiggle's generous gesture stating that I will not use Shimano chains again until they acknowledge that there is an issue with chains having such a short lifespan. I assume these are 10spd chains..? One more reason to stay with 9 speed. Maybe Shimano is owned by Toyota. bends but it doesn't crack in a visually brittle mode. This is a lot like hard anodizing rims and having them crack apart... as they did massively when the ill advised use of the method was introduced by rim manufacturers. You shouldn't wonder why I say the bicycle industry is too poor to hire good engineers. There's no one in charge in the engineering department." I had 2 Shimano Ultegra 6600 chains break. Thanks for the post. Now I know that I'm not alone. This observation may not be related to the mentioned failures, but all these chains (and chainrings) are appallingly dirty (for having been ridden so little). I'm going to assume wet to slushy conditions. If slush, there may be salt from the road in with all that muck. Feel free to share some pics and I'll append it to the post. Thanks. I think the Toyota comment might have some relevance. It seems to me that the Japanese business culture is to never admit a failure or problem until you have no choice. Toyota had problems in the past with engines where the oil would sludge up and as I remember they denied it until they were forced to admit it. It's a manufacturing problem, caused by over hardness (brittleness) of the plates and/or possibly a minutely undersized hole which increased the interferance fit beyond tolerance and over stressed the plate at the hole. Chain manufacturing is a straightforward process, but entails working with very tight dimensional, material, and heat treating tolerances. The trend to narrower and lighter chains narrows the working tolerances considerably, leaving almost zero margin for error. This kind of problem is likely to become more common in the future, so good QC and good vigilance by consumers is important. Those have to be some of the worst maintained chains I've seen. 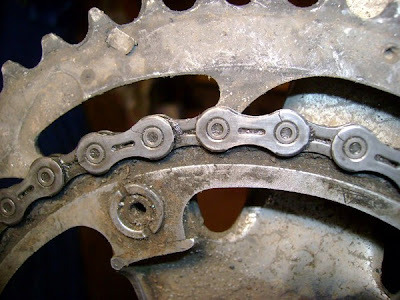 Even if the failures weren't caused by lack of maintenance - regularly cleaning and lubing your chain might give you a chance to see a crack before riding on it again! Also - who the heck uses Ultegra chains? And why? The cost savings over the Dura Ace is insignificant. I have just detected several stress failures of the same nature on a new and well maintained chain, I was totally amazed when I found them, one I could accept, a chain full is rubbish. Perhaps Shimano should be advertising these chains as single use only no more than 600Km! Four chains...all 6700 broken. I just finished pulling out of one of the biggest races of the season due to a chain I replaced yesterday due to the cracked plate. I've replaced a rear deraiiler...what's a good alternative to that piece of crap 6700? I also had Ultegra 6700 chain failure in April. It was used about 3000km's and it broke in the same way as the chains in this thread. I contacted Shimano and they said that they acknowledge the problem and they sent me new chain that is so far working well and I haven't seen cracks in chain. Here is pictures of mine with about 1500 miles. I lube with dumonde tec every 150 miles or so. I never degrease and just wipe the chain after lubing. This method has always worked well for me in the past. I got 4000 miles out of my last 7900 chain before it became stretched. I purchased two chains when I got this one. The other is on my cyclocross bike with about 500 miles. I can't find any cracks in that one yet. Thanks, i was just about to order a new Ultegra chain and i'll be getting something else! Wouldn't fancy it snapping in a sprint! Ive just had an Ultegra 6700 brake after only 2 weeks and 250 miles. After a closer inspection I can see many small cracks in the side plates. I wont ever by a Shimano chain again.